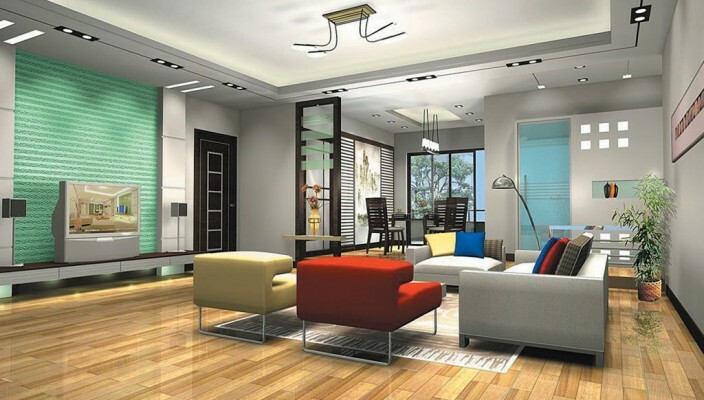 Blending of colors is the buzzword in this living room design. A contemporary style sofa set with different colors that are extremely comfortable and easy to maneuver. The wooden flooring adds a rugged feel in this trendy living room design. The green backdrop for the entertainment unit is interesting and current. Focus lights are placed in pairs uniformly all over the room. Greenery adds dimension and appeal. An open dining room overlooks the living room. The front door interestingly designed adds volume with the rosewood finish. Walls are simple and pastel. A vertical separator that houses simple sculptors with a glassy look marginally breaks down the mix of color. Boxed designs are old school and this dynamic look for the living room design is streamlined to suit the palate for a modern outlook. One look at the room and there’s a spring in your step and color coordinates are fun.